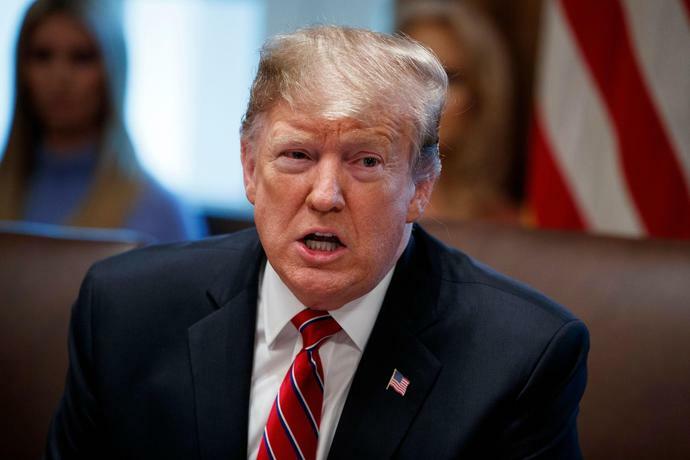 WASHINGTON - President Donald Trump slammed a tentative border security agreement reached by congressional negotiators looking to avert another government shutdown, but he did not say whether he would sign the legislation if it reaches his desk. "Am I happy? The answer is no, I'm not," he said. "I'm not happy." While Trump said he is "thrilled" with the direction negotiations are going, the tentative deal is "not doing the trick." On Capitol Hill, meanwhile, Senate Majority Leader Mitch McConnell said the Senate could vote "in short order" on the tentative proposal. McConnell, R-Ky., said during a speech on the Senate floor that negotiations "were able to move forward productively" after Democrats moved off their position that Congress shouldn't spend "one dollar" on new border barriers and dropped their demand for a hard cap on U.S. Immigration and Customs Enforcement detainees. Senate Minority Leader Chuck Schumer, D-N.Y., said the agreement represents "a path forward for our country" and would help avoid "another round of fraught negotiations" as lawmakers rush to beat a fast-approaching deadline. Trump, in his remarks at the White House, said he would be "adding things" to the agreement, but it wasn't clear whether the bipartisan group of lawmakers that negotiated the deal would agree to any changes. The deal, announced late Monday as Trump was about to take the stage at a political rally in El Paso, Texas, includes $1.375 billion for a structure along the southern border - well below the $5.7 billion Trump has demanded for the wall that he made a central promise of his 2016 presidential campaign. Democrats sought to limit the number of detention slots, or "beds," that ICE could have at its disposal to detain immigrants in the country illegally who were apprehended within the nation's interior. Democrats had originally hoped to cap that number at 16,500. The White House rejected that proposal and Trump repeatedly slammed it publicly. Conservative commentator Ann Coulter blasted the tentative deal on Twitter, writing that Trump "talks a good game on the border wall but it's increasingly clear he's afraid to fight for it." Opposition from Coulter and other high-profile conservatives was widely viewed as influencing Trump to reject another bipartisan agreement late last year, a move that led to the last government shutdown.